Ladenia or Ladopita is the traditional pie from the Greek island of Kimolos but it’s widely known all over the Cycladic islands. 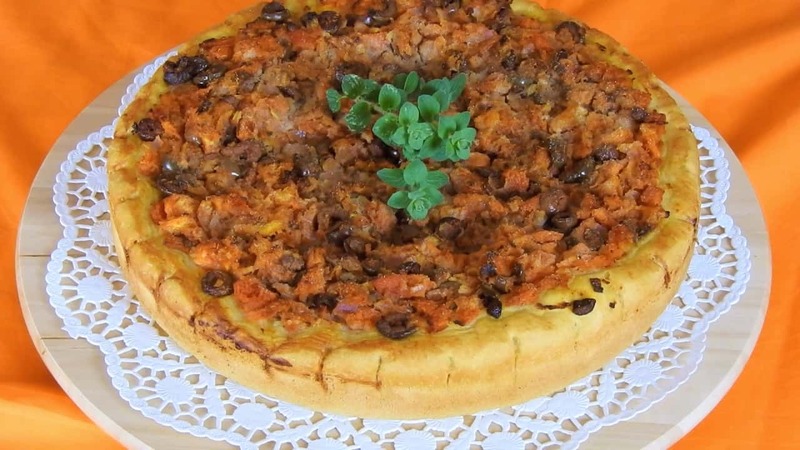 It’s an easy to follow recipe with few and simple ingredients and it’s very similar to a fasting pizza.The recipe is taken from the invaluable book “Olive Oil – Secrets of Good Health” by Nikos Psilakis and Maria Psilakis, my true companion and guide in the kitchen. NOTE: Peel, seed and cut the tomatoes in cubes. Put them into a strainer for a while. Heat 100ml olive oil in a wide pan, over high heat. Add the onion and saute for 4 to 5 minutes. Season with just a pinch of salt. Olives will add the extra taste we need. Add the tomatoes and stir gently for 2min. Remove from heat and mix in the olives and the oregano. In a large bowl combine flour with yeast. Make a well in the center and add salt and olive oil. Add the water and mix until the sides of your bowl are clean. Take the dough out of the bowl and knead for 10min until it’s smooth. Oil a round baking pan 34cm / 13.3” in diameter. Spread the dough in the pan covering the bottom and up the sides evenly. Place it in a warm spot and let it rise for 20 min. Sprinkle some semolina in order to absorb the excess moisture and prevent the dough from getting soggy. Spread the filling evenly into the pan. Using a scissors, make small cuts to decorate the dough. Sprinkle some semolina, drizzle with olive oil and it’s ready for the oven! Bake in a preheated oven, at 200⁰C / 400⁰F for 40 to 45 minutes.